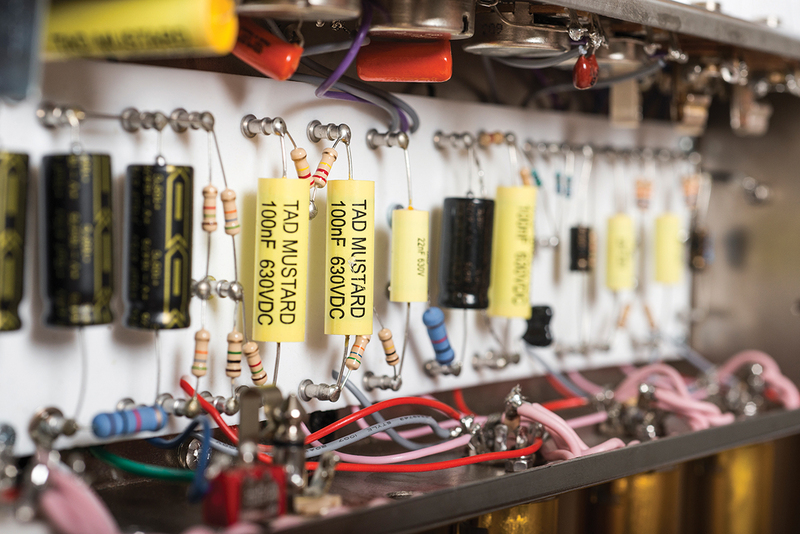 Honeyboy is a relatively new custom-amp manufacturer based just outside Glasgow. Wherever possible, owner Andy Smith does everything in-house, from populating the boards to powder-coating metal parts and even building solid hardwood cabinets. We checked out his 18 and 5 combos and visited his workshop in late 2017 and were suitably impressed – but this is something considerably louder. 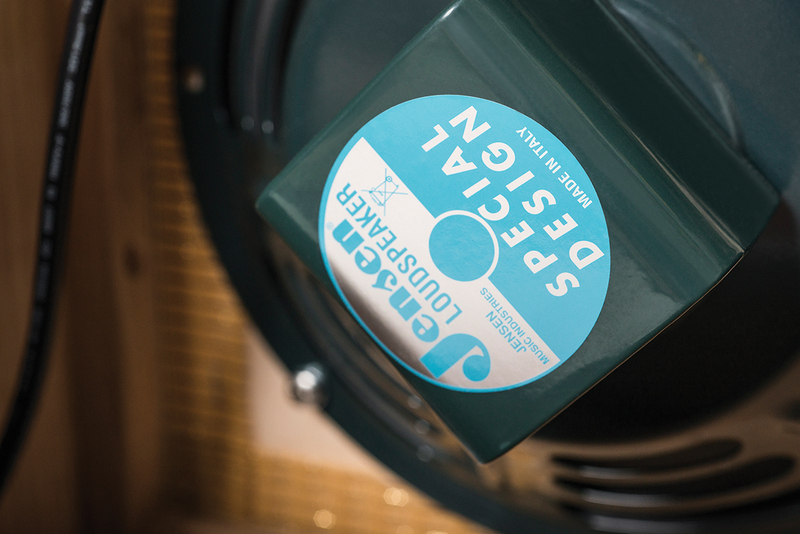 Based on Fender’s tweed Bandmaster combo, the Honeyboy 30’s oak and beech cabinet houses three 10-inch speakers – two Jensen P10R alnicos and a ceramic Celestion G10 Greenback. The 30 is based on the narrow-panel tweed model – which The Who aficionados will know as the amp that partnered Pete Townshend’s Gretsch 6120 to devastating effect on Who’s Next and 1973’s Quadrophenia – but with the added benefit of a negative feedback defeat switch. One of the most distinctive hallmarks of Honeyboy’s amps are their looks – with bright colours and reptile-skin effect vinyl never too far away. This particular 30 is something a bit different, however. 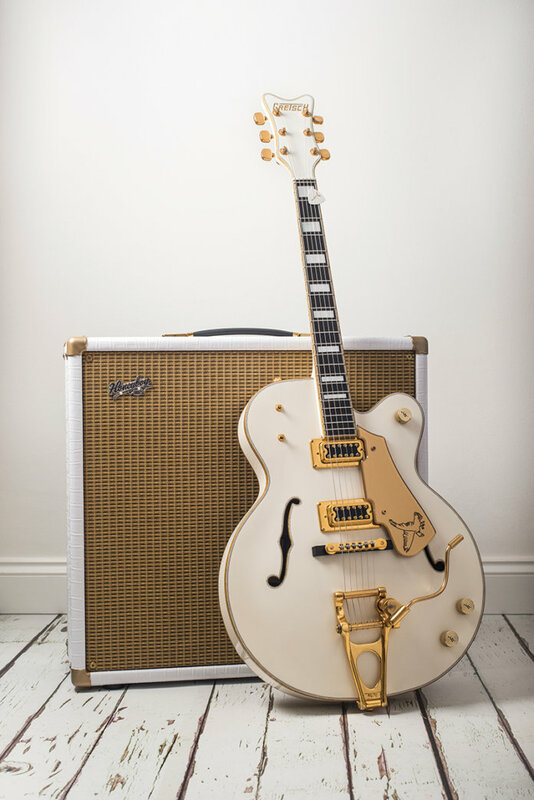 We asked Andy if he could build the amp equivalent of a Gretsch White Falcon, and the results are spectacular! 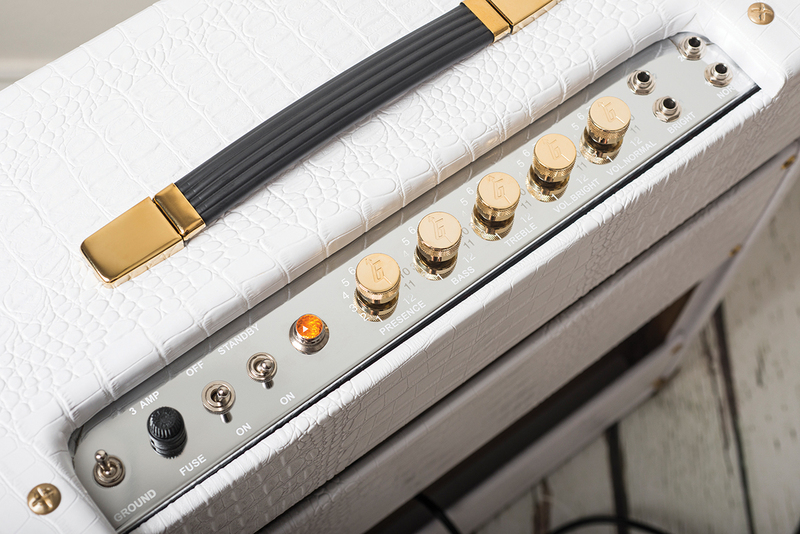 The shimmering white vinyl and gleaming gold won’t be for everyone, admittedly – but such is the custom nature of Honeyboy’s amps, you can opt to be as flash or restrained as you wish in the looks department. If you’ve played enough tweed amp circuits you’ll probably be aware of the fact that, when there are two channels and four inputs, only one of them is likely to sound any good – namely Bright number 1. But the Honeyboy 30 has a surprise in store for us, because the Normal channel offers an eminently usable alternative voicing. We’ll come back to that after we have examined our old friend, the Bright channel. The term ‘live one’ is occasionally attributed to guitars that are extremely touch-sensitive and responsive, but sometimes it can apply to amps, too, and the Honeyboy 30 is just such a beast. Kicking off with our Gretsch 6120 conversion (of course), we’re shocked to find that every little nuance of pick attack, flesh on string and even switch adjustment comes straight through the speakers. At first, this feels a bit unnerving, but it quickly becomes thrilling. The amp’s tone and volume controls interact noticeably, with the bass control in particular having an effect on gain as well as low-frequency content. With both tone controls set around halfway, the Honeyboy 30 stays clean until the volume reaches around three. However, if you roll back the bass, you get more clean headroom and the amp stays pretty clean until around five. Listen closely and you’ll hear how turning the bass up introduces overdrive in the bass and low-mid frequencies to create an earthy roar. Similarly, the treble control introduces a crunchier overdrive higher in the frequency range, so to an extent, you can balance all three controls to achieve the desired level of overdrive and target the frequencies at which that overdrive occurs. The range of tones and textures is very wide and, sticking with the Gretsch, we go from warm Chet Atkins cleans into the squeaky bite of Setzer and beyond into Malcolm Young grind. But the real magic happens when the volume and treble controls are set around eight (out of 12) and the bass is dialled back. This is where we find the Townshend-style jangling powerchords of Who’s Next, where shimmering treble is layered over growling low-mids to create the effect of an acoustic mixed with an electric. 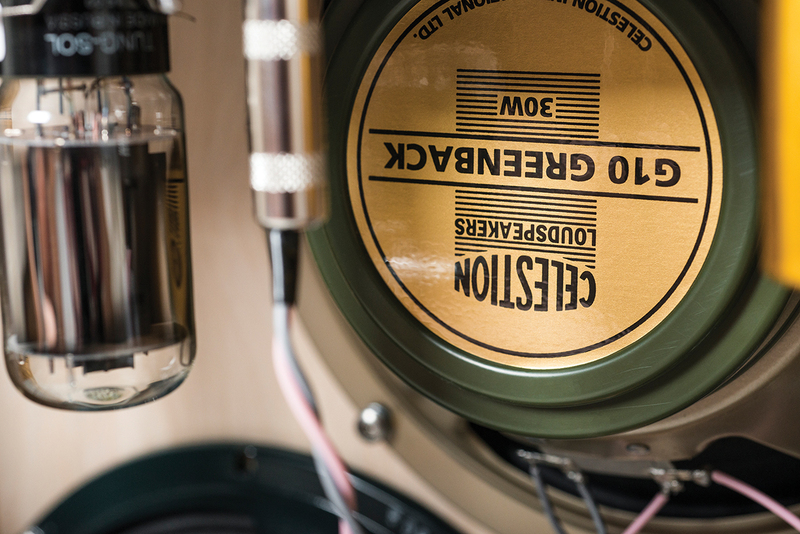 Our Gretsch has never sounded this good, but you don’t need Filter’Trons to do it. Swapping over to a non-reverse Firebird, we find P-90s produce very similar results. Everything about the Bright channel reminds you how the Brownface and Blackface circuits were a logical progression from the larger late-50s tweeds. Adding some Catalinbread Topanga reverb, the Honeyboy 30 has that side of things largely covered and it can even do bell-like clean Hendrix tones. The Normal channel deserves way more than the usual cursory mention. If your tastes in tweed tone veer towards thicker, dirtier, smaller models, such as the Deluxe, you may be even happier here. As you’d expect, the sound is somewhat darker, but it’s far from dull, and there’s no shortage of clarity. There’s ample gain here, too – aided and abetted by a smoother and sweeter overdrive and a softer transient attack, which creates the impression of enhanced sustain and is less brutally revealing. The growl and snarl of the Bright channel becomes a roaring grind as the Normal channel is pushed. You get roadhouse blues tones with a Strat and muscular classic-rock crunch and note bloom with a Les Paul. 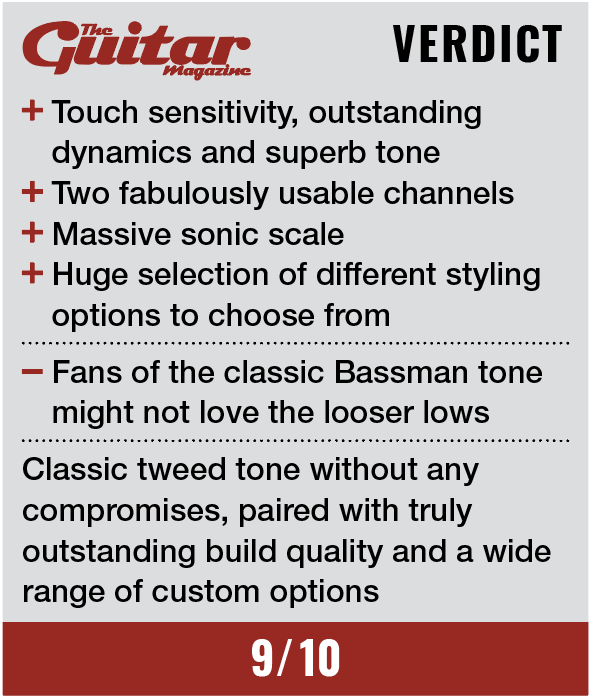 Although the Normal channel has certain small-box tweed characteristics, the sheer volume, scale and breadth of the sound are anything but. Treble is hugely extended and bass is massive, so with both channels, and the Normal channel in particular, the bass control needs to be run quite low. 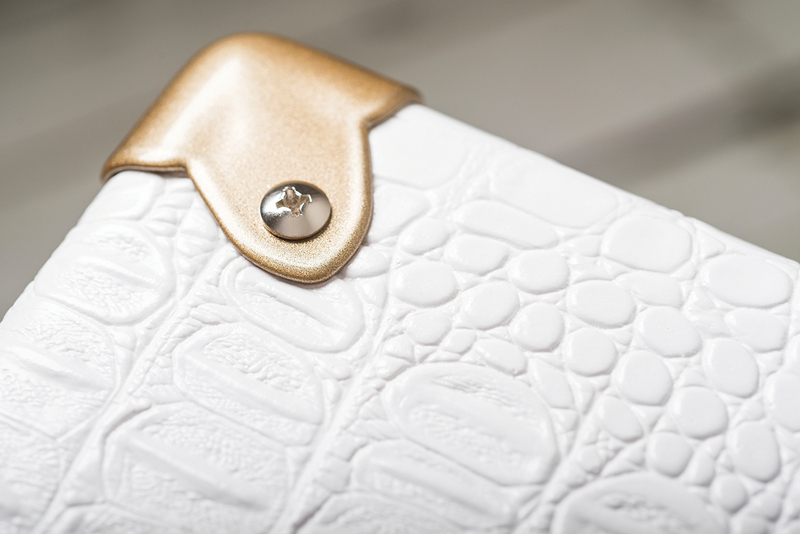 The negative feedback switch has more effect on feel than tone and it’s a feature we like. We find it effective for softening the attack and lowering the overdrive threshold, so much depends on the amount of volume and clean headroom the situation demands. It does disengage the presence control, but with all the extra harmonics, you won’t miss it. Although Fender’s tweed Twin (low power), Super, Pro and Bandmaster circuits are more or less the same, the amps themselves do sound different. Some attribute the Bandmaster’s tone to the slightly odd relationship between its four-ohm output transformer and the 2.67-ohm load of three eight-ohm speakers wired in parallel. We don’t have a vintage Bandmaster on hand, but the Honeyboy overdrives more easily than a ’59 Bassman we’re able to compare it to. While it has a similar treble character, the Honeyboy 30 has looser lows and a more snarly and raunchy character. On balance, we prefer the way it plays and sounds.